August 15, 1965 was a historic date in the annals of rock and roll. The Beatles played in front of 55,600 frenzied “Beatlemaniacs” in the fist rock show at a major stadium. Playing 12 songs in 30 minutes, the four lads from Liverpool were barely heard by the screaming fans and by each other. The Beatles stage monitors were not up to today’s standards, so the band played by heart and instinct in order to put on a stellar show. The concert was the template for every other future record-breaking stadium show (“Led Zeppelin”-Tampa Stadium) and mega-festivals like Woodstock, The Isle of Wight Festival, California Jam and Texas Jam to name a few. It also showed that rock and roll was here to stay. As it so often happens in life, things come full circle. On July 17,18 and 21 2009, Paul McCartney returned to the scene of past glory( a few hundred yards away) to play in front of 109,397 fans over three nights at the new home of the Mets, Citi Field, recapturing past glory with a dynamic, well performed concert extravaganza. 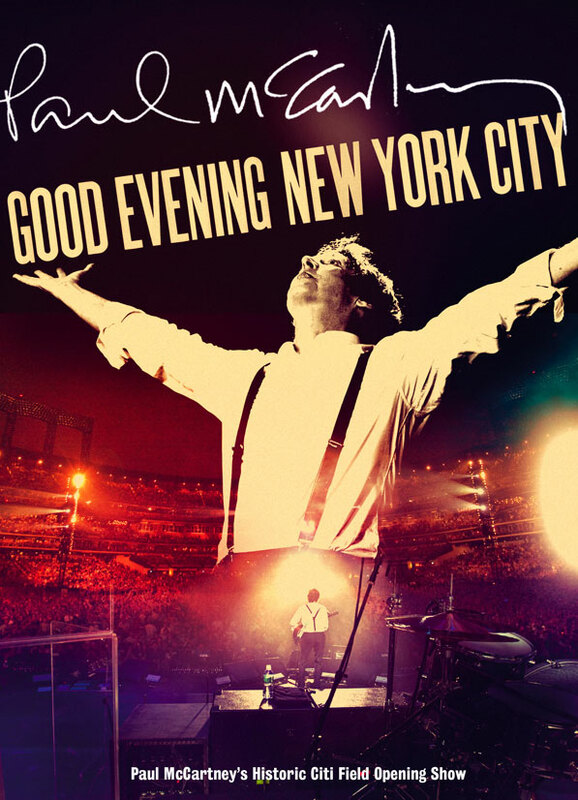 “Good Evening New York City,” a new 33 song + DVD package is must for McCartney fans who are Beatle fanatics, embrace his solo career with “Wings” and after and just want to hear a polished, professional and talented legend do what he does best, perform at a high level and never disappoint. The sixty-seven year old legend, who had celebrated that birthday a month earlier, sang in most of the original keys that the songs were written in, which is a challenging undertaking considering how long ago some Beatles classics like, “Drive My Car” (a great show opener), “Got to Get You Into My Life,” “Eleanor Rigby,” “Day Tripper,” “Paperback Writer” and “I Saw Her Standing There” (featuring guest Billy Joel) were conceived. His bass playing and piano work are also first-rate and underscore the fact that he is still an underrated musician despite his iconic status. A particular touching aspect of the show is McCartney paying homage to his deceased former band mates George Harrison (Disc 1) and John Lennon (Disc 2). He sings “Something,” a Beatles standard that was written and sung by Harrison on “Abbey Road.” A unique aspect of this performance is McCartney utilizing a ukulele and his voice alone as he did on the “Concert for George” tribute concert. It is a stripped down raw, emotional high point of the show and a fitting gesture. It eventually morphs into a band version with a beautiful guitar solo that does justice to Harrison’s on the original piece. McCartney also sings the Beatles “A Day in the Life” and Lennon’s “Give Peace a Chance” together, thus paying tribute to Lennon, singing his verse on the former and getting the crowd involved in a sing-along with the Lennon plea for peace from his solo career on the latter. Emotion aside, McCartney’s band rocks, pure and simple. The opening track of disc two, “Back in the U.S.S.R.” is an example of rock brilliance and features an “incendiary” guitar solo by Rusty Anderson. It is followed up by “I’m Down” which he performed on that aforementioned magical night in 1965. “I’ve Got a Feeling,” from 1970’s “Let it Be” is done fantastically with Paul’s band mate filling in admirably on Lennon’s parts. It must be underscored that McCartney’s band, which consists of Paul “Wix” Wicken (key boards), Brian Ray (bass guitar), Rusty Anderson (guitar-mentioned above) and the powerful Abe Laboriel Jr. (drums), are a great band and not just an undistinguished backing band. Wicken’s keyboard work along with strings and horn simulation is wondrous. Some songs that were never performed by the Beatles on stage because they stopped touring in 1966 are reproduced brilliantly on this release. McCartney brings down the house and fills the crowd with emotion on “Let It Be,” “Yesterday,” “Hey Jude” and brings the show to a “fiery” crescendo with “Helter Skelter,” “Get Back” and the reprise of “Sgt. Pepper’s Lonely Hearts Club Band” and “The End”, the last thing the Beatles ever put on record( remember those?). The show never lets up and was not just a wink at the past, but rather an affirmation of McCartney’s talent and dedication to his craft to this day. If that is not enough to titillate you, the third disc is a DVD of the whole show filmed masterfully with incredible sound. A nice touch is camera shots of the enthusiastic crowd of all ages that is not done gratuitously that captures the historic significance of the concerts and the emotion and enthusiasm of the crowd that witnessed a landmark moment in rock history. The tracks on the CD and DVD are culled from performances during the three-night run. There will be a deluxe set released (2CD’s+2DVD’s) which will feature expanded packaging and a bonus DVD which features McCartney’s July 15, 2009 performance on the David Letterman show in which McCartney played on the marquee of the Ed Sullivan Theater (where the Beatles played Sullivan’s show many moons ago). This impromptu appearance caused traffic and pedestrian logjams in the area.The short set by McCartney was aired on Letterman’s show. This package includes bonus tracks that were not shown on the broadcast. Steve, I really enjoyed reading the review!! He played “Something” on the ukulele________wow! Somehow I missed this one when it was first posted. One thing about McCar5tney – even though he’s turned into an “oldies” act (IMHO), he puts 110% of his energy into his live shows and never comes across as stale. Remarkable for someone pushing 70.